This post is sponsored by TRESemmé, a product by Unilever. LOVE the combination! The bracelet is so cute! Your pictures are making me miss New York so much! The white dress is perfection on you, Rachel. Love the heels too! This dress is absolutely gorgeous Rachel! I love your Celine bag as well! Hope you are having an amazing time at fashion week, it’s great to see all of your beautiful pictures! Looking so beautiful in this enchanting outfit!! Pretty in all white!!! Looks like you had an amazing time at fashion week! Love that white dress…such a great piece you can wear year round! that dress is so beautiful! They did a great job with your hair, too. Such a beautiful white dress! There’s so much detail and little layers to it, it makes it so special! That dress is popular! GalMeetsGlam wore it at NYFW too! gorgeous. I’m glad you are having such a great time in NYC. You look lovely in that white dress. Love your hair! That dress is GORGEOUS! Loving it with the red accessories! Your dress is gorgeous! Love what they did with your hair! So pretty! I love the midi length. Love the white and red pairing! That hairstyle is perfect – and it really does compliment your outfit so well! Pretty dress! Where is the bracelet cuff from Rach? Always so gorgeous! I love the white dress! Love your outfit and your hair! The eyelet details of the dress are gorgeous! Such a lovely and feminine look! Such a beautiful dress…your photos came out so vibrantly. I love all the eyelet detailing!! Literally obsessed with this dress!! So beautiful!!! Love! Such a beauty! I love this dress on you. LOVE this white dress, especially with the red! Such a great pick. Gorgeous! I’d love to go to NYFW one day! LOVE the white dress and heels. And the pops of red. Stunning. Wow… Amazing look! It’s just PERFECT! All this lace is so pretty! I love how you’ve done your hair. It just makes your outfit more romantic and fairytale-like! Gorgeous dress! I love your POC with red lipstick and a fantastic handbag to match! I love your hair! It’s the perfect style with this dress. Looks like a fun time at fashion week! LOVE that dress!!!! You looks so pretty and your hair looks amazing. I’m enjoying your SC from NYFW :) I hope you and your family are having a GREAT time. The lace on the Alexis dress is gorgeous!!!!! I love your look, and yes the hairstyle is the perfect touch. The Rachel Zoe show was a fav of mine. what a stunning dress, you look beautiful! such a cute outfit! love your bag! Such a pretty feminine look! This dress is SO gorgeous! I also love your hair. 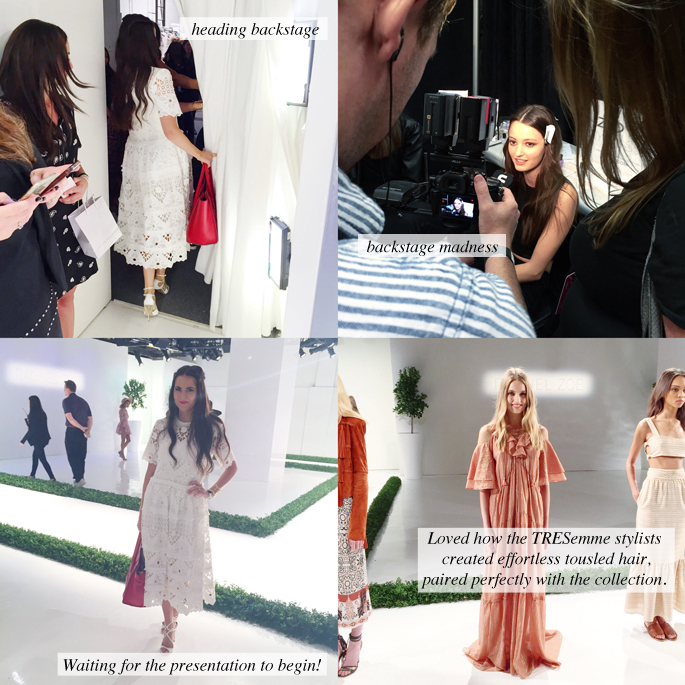 It’s been fun following you on SnapChat at fashion week! That dress is absolutely gorgeous!! I’m so in love with it! love your hair in these pictures. perfect for the carefree white outfit. The detail of the lace on this dress is perfect! Alexis makes beautiful and unique clothes!!!! I absolutely love this look. The white and red compliment each other really well. Looking stunning, love the little side braids too! What a gorgeous dress! That lace detailing is stunning! I love Rachel Zoe! Beautiful dress, you look fabulous!! Wow, Rach, what an awesome opportunity to head backstage at a NYFW show, congrats! I love your dress, it’s so feminine and perfect for the weather we’ve been experiencing here in NY. I also loved how you added some pops of red, perfection! Have an amazing day and enjoy that Yoga class! So exciting!! Love this little behind the scenes post! Your hair is so long and beautiful. Looks gorgeous. That white dress with the red bag are so beautiful too! How fun to see the Rachel Zoe presentation. I’m a long-time fan of hers. Lovely shots! That white dress is so darling, and I love your hairstyle as well – the braids are so sweet! Such a pretty, feminine look! I love the pop of red with that Celine! Love your Jimmy Choo heels with this dress, so chic and pretty! such a pretty white dress! Love the bright of white – such a great outfit to end summer with! The dress is so gorgeous! I just love all white outfits. love the dress! looking fab! Love love love this dress! It would be perfect for wedding festivities! I’m loving your NYFW feed!!! Also, loving your bag, and the hairstyle TRESemme did!!! It’s gorgeous!!! In love with this white dress! Love love love that dress! The color, pattern, length; everything about it is perfect! In love with this romantic look!! Gorgeous white dress!! Your hair is really the perfect finishing touch. Great pictures. I’m in love with this dress! You look fabulous! Do you not post on Fridays anymore? Love that dress and hair style paired together! Such a cute, feminine combination! This dress is everything!!! Elegant, feminine, and flirty- it is just perfect. Also love your hair like that, it compliments this look just perfectly! You looks absolutely gorgeous in this outfit!! Beautiful dress, looks gorgeous paired with red. Looking so feminine and chic in this outfit! I love your lace dress. It is so beautiful and feminine yet modest. The red handbag adds such a lovely burst of colour! I love your lace dress. It is so beautiful and feminine yet modest. And the red handbag adds such a fun burst of colour! This dress is STUNNING! wow! so beautiful! I love all of your outfits and purses especially this one! Is the the Celion micro?